The kepi (English: /ˈkɛpiː/ or /ˈkeɪpiː/) is a cap with a flat circular top and a peak, or visor. Etymologically, the term is a loanword of a French loanword 'képi, itself a re-spelled version of the Alemannic Käppi: a diminutive form of Kappe, meaning "cap". In Europe, this headgear is most commonly associated with French military and police uniforms, though versions of it were widely worn by other armies during the late 19th and early 20th centuries. In North America, it is usually associated with the American Civil War, as it was worn by soldiers on both sides of the conflict. The kepi was formerly the most common headgear in the French Army. Its predecessor originally appeared during the 1830s, in the course of the initial stages of the occupation of Algeria, as a series of various lightweight cane-framed cloth undress caps called casquette d'Afrique. These were intended as alternatives to the heavier, cloth-covered leather French Army shako. As a light and comfortable headdress, it was adopted by the metropolitan (French mainland) infantry regiments for service and daily wear, with the less practical shako being relegated to parade use. In 1852, a new soft cloth cap was introduced for campaign and off-duty. Called bonnet de police à visière, this was the first proper model of the kepi. The visor was generally squarish in shape and oversized and was referred to as bec de canard (duck bill). This kepi had no chinstrap (jugulaire). Subsequent designs reduced the size of the cap and introduced chinstraps and buttons. The kepi became well known outside France during the Crimean War and was subsequently adopted in various forms by a number of other armies (including the U.S. and Russian) during the 1860s and 1870s. In 1870, when troops were mobilized for the Franco-Prussian War, large numbers of French soldiers either refused to wear the issued shakos or threw them away. Emperor Napoléon III abolished the infantry shako for active service and replaced it with the kepi on 30 July 1870. By 1900, the kepi had become the standard headdress of most French army units and (along with the red trousers of the period 1829–1914) a symbol of the French soldier. It appeared in full dress (with inner stiffening and ornamental plume or ball ornament) and service versions. Officers' ranks were shown by gold or silver braiding on the kepi. The different branches were distinguished by the colours of the cap – see the table. Cavalry normally wore shakos or plumed helmets, reserving red kepis with light or dark blue bands for wear in barracks. General officers wore (and continue to wear for ceremonial purposes) kepis with gold oak leaves embroidered around the band. In 1914, most French soldiers wore their kepis to war. The highly visible colours were hidden by a medium blue-grey cover, following the example of the Foreign Legion and other North African units who had long worn their kepis with white (or later khaki) covers in the field. With the adoption of "horizon blue" (light blue-grey) uniforms and steel Adrian helmets in 1915 to replace the conspicuous peacetime uniforms worn during the early months of war, the kepi was generally replaced by folding forage caps. Officers, however, still wore kepis behind the lines. Following the war, the kepi was gradually reintroduced in the peacetime French Army, but was never adopted for wear in the Navy or Air Force. The Foreign Legion resumed wearing it in 1926; initially in red and blue, and then in 1939, with white covers on all occasions. 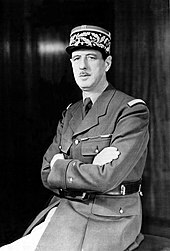 The bulk of the French army readopted the kepi in the various traditional branch colours for off-duty wear during the 1930s. It had now become a straight-sided and higher headdress than the traditional soft cap. This made it unsuitable for wartime wear, and after 1940, it was seldom worn, except by officers. An exception was the Foreign Legion, who, previously just one of the many units that wore the kepi, now adopted it in its white version as a symbol. The decision following the 1991 Gulf War to end conscription in France and to rely on voluntary enlistment has led to the readoption of various traditional items for dress wear. This has included the reappearance in the army of the kepi which is now worn by all ranks in the majority of units, on appropriate occasions. Within the army, particularly notable are the kepis of the French Foreign Legion, whose members are sometimes called Képis blancs (white kepis), because of the unit's regulation white headgear. Former cavalry units wear light blue kepis with red tops and silver braid (for officers) and insignia. Other colours include all dark blue with red piping (for artillery units), dark blue with red tops (line infantry) and crimson with red tops (medical). The "dark blue" of officers' kepis is actually very similar to black. The French National Police discarded their dark blue kepis in 1982, adopting a low peaked cap. The reason given was that the rigid kepi, while smart and distinctive, was inconvenient for ordinary use and too high to be comfortably worn in vehicles. French customs officers (douaniers) and the Gendarmerie still wear kepis for ceremonial duty. Customs officers wear a baseball style cap for ordinary duties (since 1994 with many variations) while the Gendarmerie introduced a "soft kepi" in the early 2000s. Irvin McDowell and George B. McClellan wearing the two most common regulation kepis of the US Army. The McDowell cap had a crescent shaped peak, while the McClellan cap was more fitted. In the United States, the kepi is most often associated with the American Civil War era, and continued into the Indian Wars. Union Officers were generally issued kepis for fatigue use. A close copy of the contemporary French kepi, it had a sunken top and squared visor. It was often called a "McClellan cap", after the Union commander of the Army of the Potomac, G.B. McClellan. For field officers, the caps were often decorated in a French-influenced style, with a dark velvet band around the base and black silk braiding on the crown. The kepi was also popular with various state units and as privately purchased headgear; e.g., it was standard issue in 1861 for New York infantry regiments. United States Cavalry - Dark blue with a yellow base. The US Army's and Air Force's current patrol cap, the standard covers in utility uniforms (the ACU and ABU, respectively), is a variation of the flat-topped, visored kepi. Its modern lineage can be traced to World War II, and during the Cold War period was "blocked" with heavy starching and ironing (referred to as a "Ridgeway cap"). It was replaced with a baseball-style cap during the Vietnam War. The present-day patrol cap was introduced in the 1980s with the transition to the M81 BDU uniforms, and was retained when the Army adopted the UCP digital-pattern camouflage uniforms in 2005, and Air Force's adoption of the ABU in 2007. Chilean Army generals in their French-influenced uniforms: Gorostiaga, Lopetegui, Bulnes, Körner, Baquedano, del Canto, Cortes, Novoa. During the Paraguayan War between Brazil, Argentina, and Uruguay versus Paraguay — the Brazilian, Argentine, and Uruguayan troops and officers primarily wore kepis, though many Brazilian troops wore brimmed hats, and Uruguayan and Argentine light infantry wore shakos. The Paraguayans mostly wore leather shakos, but senior officers were given kepis. Leather kepis were however issued as a forage cap to Paraguayan troops, and because of poor supply standards, were often seen in combat. With the exception noted below, the Chilean Army no longer wears kepis, but during the War of the Pacific, it was part of the standard army uniform. Similarly, the kepi is no longer worn by the modern Peruvian armed forces and police, but was part of the uniforms worn during the 19th and early 20th centuries. in Peru, the Fanning Marine Company of the Peruvian Navy; and the National Police of Peru's Guards Inspector Mariano Santos Company. Both retain the War of the Pacific uniforms, respectively, of the Peruvian Navy and the Civil Guards of Peru. A Peruvian Army company has recently adopted the kepi and white uniforms worn by the 2nd Infantry Battalion "Zepita" — a style used during the War of the Pacific — for public parades. Bolivia's 1st Infantry Regiment "Colorados" and the 2nd and 3rd Infantry Regiments of the Bolivian Army also wear the kepi as part of their full dress uniforms on major ceremonial occasions. The Argentine National Gendarmerie (Gendarmería Nacional Argentina; GNA) members wears a green kepi as part of fatigue and full dress uniforms. Kepi of the Corps of Gendarmerie of Vatican City. The practical nature and relative cheapness of the kepi made it a popular military headdress from the mid-nineteenth century on. Many Latin American armies wore kepis in the late 19th and early 20th centuries which were close copies of the French model. Other armies that favoured kepis during the final period of colourful uniforms that ended with World War I included the Danish, Portuguese, Dutch, Italian (officers only), and Romanian armies. Even the Japanese Army adopted French-style kepis for senior officers in full dress, as well as for their Gendarmerie units and military bands. Significantly such historic opponents of France as Germany and Britain, avoided the use of kepis, with only a few short-lived exceptions, such as for service in India during the 1850s-60s. During this time the Albert Shako was preferred. This may have been for practical rather than patriotic reasons, as the distinctive profile of the kepi would be likely to lead to confusion in battle. Influenced by France's adoption of the kepi, Belgium introduced it in 1845 as a forage cap for infantry other ranks. This headdress was worn until 1868 when a new model without a vizor was adopted. Officers of infantry and cavalry regiments wore their own version of the kepi from 1859 until the First World War. It was modified several times over the decades, the last version being the 1900/1910 model. By that time it had evolved into a comparatively tall cylinder with the national emblem at the front and a cross-shaped Austrian knot on the crown. The wearer's rank was indicated by a system of horizontal and vertical bands of gold or silver braid. The kepi was also worn by officers of the General Staff. In September 1914 the wide range of peacetime headdresses (shakos, busbies, "Corsican" caps, czapkas and bearskins) still being worn by the Belgian Army, were replaced by the universal "Yser" kepi. This consisted of a dark blue or green soft cap with folding double flaps. With the adoption of a British-style khaki uniform from 1915, the kepi was abandoned in favour of the peaked cap for all ranks, with the exception of the paramilitary Gendarmerie, who continued to wear the kepi as part of their parade dress until the 1960s. Used by all soldiers of the Danish army until World War II, it is now only retained as part of the full dress uniforms for officers. Until the early 20th century the Greek Army wore dark blue or green (the latter for cavalry) kepis, and continued the same style of headress in khaki when field uniforms of that colour were introduced in 1910. Officer cadets and NCO trainees still wear kepis as part of the full dress uniforms of their respective military academies. In India, during the French colonial rule of Pondicherry, Yanam, Karaikal and Mahé, Kepis were worn by two kinds of policemen, the Armed and the Indigenous, differentiated by the colour of the kepis they wore. While the law and order forces wore bright red caps, the armed constabulary was conspicuous by its blue kepis. After Indian Independence, the former French colonial territory was integrated into the Union Territory of Puducherry and the bright red kepi continues to be the headgear of the constabulary — both for the local and the armed police signifying the cultural and administrative legacies left by the former colonialists. In Iran this kind of headdress was known as the "Pahlavi hat" (kolah pahlavi, کلاه پهلوی). Only worn for a brief period, from 1927 until the 1930s, it was generally of a grey color. In modern ceremonial dress the Latvian National Armed Forces Staff Battalion and Staff Orchestra both wear backward sloping kepis of the style worn by the Belgian Army immediately prior to World War I.
Kepis with a slightly higher back were formerly worn by the Luxembourg Army until 1945. Since World War II they were replaced by British Army-style peak caps. The same kepis with higher back were also worn by the former Grand Ducal Gendarmerie in a blue version corresponding to the colour of their uniforms. The kepi is still used by the newly created Grand Ducal Police which replaced the Gendarmerie and the local police forces in 2000. The brown stiff képi (Schaftmütze) of Hitler's Brownshirt Stormtroopers (SA, Sturmabteilung) and its black version initially worn by the members of the SS (before it was replaced by a peaked cap) were derived from surplus Austrian equipment. In Spain, a version of the kepi (actually a low shako), the ros, is used by the Guardia Real (Royal Guard) and the Regimiento de Infantería Inmemorial del Rey for ceremonial functions. The Spanish 1887 regulation kepi or Teresiana was made of black oilcloth with a tortoise shell visor. A plainer form of kepi was retained by the Civil Guard as its non-ceremonial headdress for normal police duties, until it was abolished under the 2011 revised regulations and replaced by a baseball cap. 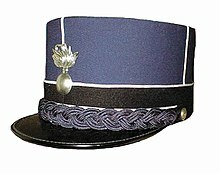 In Sweden, the kepi has been used with several uniform types. The most common was the grey kepi worn as part of the M1923 field uniform and the dark blue kepi worn as part of the uniform types m/1886 and m/1895, and still in use by the Life Guards. In Switzerland, the kepi was worn as a part of the dress uniforms of senior NCOs (Sergeant major and above) and officers (with additional rank insignia) until the 1995 army reform (Swiss Armed Forces). Since then, it is only worn by senior staff officers (Brigadier general and higher). In Thailand, the kepi has been using with study uniform and casual uniform of police cadets at the Thai Royal Police Cadet Academy (RPCA). in Brisbane, Australia drivers and conductors continued to wear distinctive white kepis with black visors until 1961. Brisbane bus inspectors continued to wear black kepis with decorative braid until the introduction of a blue version in 1987. Brisbane Transport finally replaced inspector's kepis in 1995, although as of 2006 they could still be worn at official functions. Belgian Railways conductors (but not train drivers or other personnel) wear a kepi as part of their daily uniform. a form of kepi modeled on the Austrian ski-cap, was the standard headgear of uniformed British Rail male employees from the mid-1960s to the mid-1980s. A round peak-less cap with an outline resemblance to a kepi is also worn by traditional student fraternities, also called Studentenverbindung, in Germany, Austria, Switzerland and Belgium. They come in different varieties and are very colorful in appearance. Wikisource has the text of the 1905 New International Encyclopedia article Képi. Wikimedia Commons has media related to Kepis. ^ Nicholson, J.B.R. Military Uniforms. The Splendour of the Past. ISBN 0-85613-136-9. ^ Mollo, John. Military Fashion. pp. 159–162. ISBN 0-214-65349-8. ^ Coune, Frederick. Les Coiffures Militaires Francaises 1870-2000 (in French). p. 65. ISBN 978-2-35250-241-8. ^ War Office, General Staff. Handbook of the Belgian Army 1914. p. 18. ISBN 978-1-78331-094-4. ^ Pawly, R. The Belgian Army in World War I. pp. 41–42. ISBN 978-1-84603-448-0. ^ Mollo, Andrew. Army Uniforms of World War I. p. 106. ISBN 0-668-04468-3. ^ Army Operational Command (September 2012). "Uniform Regulations for the Army" (PDF). parawings.com (in Danish). p. 601. Archived from the original (PDF) on 19 October 2016. Retrieved 7 November 2016. ^ "POLICE HISTORY". Government of Puducherry. Retrieved 2016-01-02. ^ Toland, John (1976). Adolf Hitler. New York: Doubleday & Company. ISBN 0-385-03724-4.